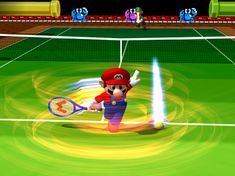 Spin Jump Return is Mario's Defensive Power Shot in Mario Power Tennis and Mario Tennis: Power Tour. Mario spins around in a cyclone similar to a Spin Jump, and spins toward to the ball, saving the opponent from gaining a point. Unlike most Defensive Power Shots, it may not work if the ball is too close to the side or the back. When Mario hits it, the ball will slightly curve with low power. Mario will move to the spot where the ball was after it is used. It can also hit lob shots. This page was last edited on April 29, 2017, at 18:24.